View More In Hair Pins. Color: Gold, Silver,Rose Gold, Black. Small items, please keep them away from children under 3 years old. 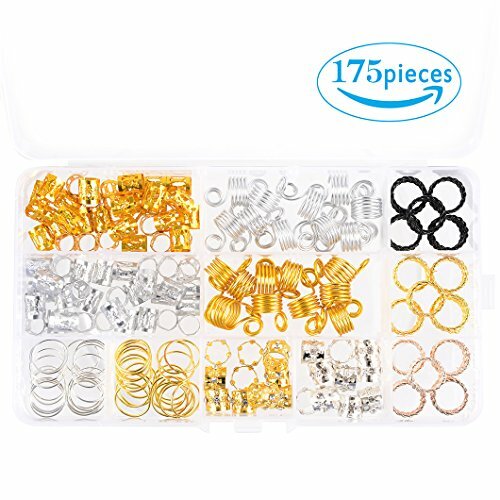 5 Different Styles:Aluminum Hair Coil Dreadlocks(Gold and Silver);Hair Braiding Cuffs Dreadlocks with Crystal (Gold and Silver);Hair Braid Rings(Gold and Silver);African Twisted Braid Spring (Gold and Silver); Hair coil dreadlocks (Gold,Rose Gold, Black) with Storage Box. Material:60 x Dreadlocks Beads Cuffs and 20 x Braid Spring made of Aluminum;60 x Hair Rings and 20 x Hair Braiding Cuffs Dreadlocks with Crystal and 15 x Hair coil dreadlocks made of Metal iron. Wide Range of Usage:For Braiding Dreadlocks or Hair Style DIY,Suitable for Party and Wedding Prom etc.The items are as Good Gifts for Your Lover, Family, Friend, Kid ,etc. Easy to Use: The Hair Dreadlocks does not Need to be Pliers and can be Opened Easily with Hands. Close it with Fingers. About after-sales service: If You Find That The Product You Received is Defective or Dislike, Please Fell Free to Contact me at The First Time, We will Give You a Satisfactory Solution at the First Time. If you have any questions about this product by Messen, contact us by completing and submitting the form below. If you are looking for a specif part number, please include it with your message. Capezio Bunheads Womens 2.5 Hairpins (BH438) -BROWN -ONE "